City of Rocks National Reserve is located in one of the innumerable remote, little-known corners of the West, in far south Idaho, 2 miles from the Utah border. This part of the state lies right at the edge of the Great Basin Desert, and the land has the familiar topography of scattered mountain ranges separated by wide, empty, sagebrush valleys. There are few roads hereabouts, and the majority of routes are unpaved, linking small sleepy villages and distant ranches. The mountains are generally uninteresting to look at from afar, formed of partly wooded sides sloping up to flat ridgelines, generally lacking any dramatic peaks; such is the case for most of the Albion Range, a north-south series of hills south of Burley, but for several square miles the usual rounded, grassy summits are replaced by fantastic formations of eroded granite - spires, cliffs, arches and narrow ravines, where the light grey color of the rock contrasts greatly with the greenish surroundings. The reserve is crossed by an unpaved scenic drive that passes viewpoints, named rock formations, an extended campground and several trailheads; hiking is the main activity here, together with rock climbing and camping. A visitor center is situated in the nearby town of Almo, 2 miles east. This area is also notable for lying along the historic California Trail, and some of the rocks along the road are adorned with dozens of signatures from early travelers. The combination of unusual geological and historic features led to protection of the area in 1957 as a state park, being transferred to NPS management as a national reserve in 1988, yet it remains one of the least known park service units in the West. Today, the reserve is jointly managed by the NPS and Idaho Department of Parks and Recreation. The reserve can be reached from the west, via paved highway 27 to Oakley, then the mostly unpaved Birch Creek Road, but the usual approach is from the east, along the Elba-Almo highway, which leads to the peaceful town of Almo, 35 miles from I-84 (see map). The NPS visitor center lies just south of town, shortly before the road becomes unpaved. 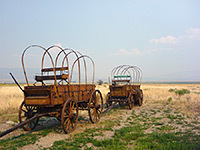 The place closes early but brochures are available outside for late arrivals; also in the grounds are two photogenic old wagons, behind which stretches a vast empty valley. The road to the reserve branches off to the west, heading towards a group of jagged pinnacles that are visible from several miles away, while approaching the town. The pavement persists just a little way, as far as the turnoff for the full service, 38 site Smoky Mountain Campground (part of the nearby Castle Rocks State Park) on the left, before being replaced by gravel. Free, primitive camping is available a few miles south, on side tracks leading into the surrounding BLM land, locations which enjoy sweeping views across the flat valley to the east. There is no entrance charge for the reserve - a fee is only required for camping ($13) which is still relatively cheap, given the scenic surroundings, even though there are no facilities. 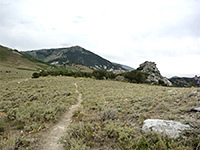 Once inside the reserve, a narrow side track (not for RVs) heads north to Circle Creek Overlook, an elevated viewpoint, but the first main site of interest is Camp Rock, one of several isolated granite peaks in the foothills - most formations are higher up, towards the mountain crest. This rock bears many inscriptions from emigrants along the California Trail, the earliest dating from the 1840s and 1850s. 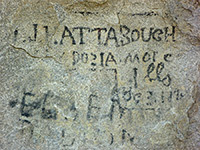 A few more can be seen on Treasure Rock, soon after which the road arrives at a junction, next to Register Rock which also has many signatures. The left (southern) route leads to one of two alternative entrances, in the southeast corner of the reserve, on the way encountering only one group of rocks, centered on the Twin Sisters, site of a picnic area and campground. The right route, a little narrower but still good for all vehicles, continues west to the main group of granite formations. Along here are more camp sites, around 60 in all, well separated and spread out along 2 miles of the road; many are right next to the granite outcrops, and occupy elevated sites looking down across the wide valley to the north (Circle Creek). 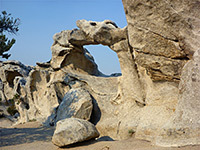 Other named formations along the road include Elephant Rock, Bread Loaves and Bath Rock, where a short trail loops around a big outcrop that holds seasonal pools near its summit. 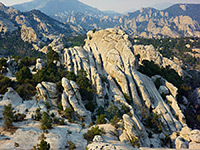 Other trails are on the north side of the road, concentrated around the Inner City, where most of the largest and most spectacular rocks are found. The road reaches a high point of 6,830 feet at Emery Pass, at the west edge of the granite region, then descends a little to the Emery Canyon entrance, and links with Birch Creek Road several miles further.